Galaxies are ever evolving systems that can provide insight into how the universe came to be what it is now. One thing we have learned about galaxies is that they often merge into larger galaxies. We know this because we can observe it (e.g. here and here). However, there is only so much you can learn by looking at these mergers since we only see a two dimensional projection. Therefore, we are going to study the Milkyway since it is the only galaxy where we can study in all three dimensions. We are also in luck for in 1994 Rodrigo Ibata discovered that the Milkyway was currently merging with another galaxy: the Sagittarius (Sgr) Dwarf Ellipsoidal Galaxy. Due to its relative small size compared to the Milkyway, the Sgr dwarf is being tidally disrupted. This means that due to the Milkyway's much stronger gravitational force the Sgr dwarf is being ripped apart and drawn out into long tidal streams that lead and follow the actual core of the Sgr dwarf. You can see a simulation of this disruption and get a better understanding of it here. This tidal debris gives us a unique insight into our Galaxy. In general, we can only tell where a star is and where it is going. However, by studying these streams we can see where the stars were. In this way streams leave a map that allow us to be able to study the gravitational potential of the Milkyway. Also, since the potential is an estimated 90% due to dark matter we will be able to get a good handle on the distribution of the dark matter within the Milkyway. It is this tidal debris that we be studying using Milkyway@home. We have developed a method to be able to isolate and determine the properties of this debris. We also do not plan to limit ourselves to simply studying known streams (this will be the first step though), but to also be able to discover/study new pieces of tidal debris. How long will it take to crunch a WU? This will ultimately depend on how we decide to split up the work and what technique we employ. However, most realistically, and to start with at least, we'll be looking at about a 4-8 fold increase over the current WU. So if it's taking you an 15-30 minutes to do the current WU you're looking at 1-2 hours. This is subject to change, however. How long will the program run? The short answer is unlimited. We have an enormous amount of data to study. Also, there will always be more (and better) data collected and many different models for the Galaxy. Therefore there will always be WUs to process using these new models and new data. What time period are we studying? Are we starting at the Big Bang or some other time? We are not doing simulation work. We are doing data analysis. Therefore we are only looking at current snapshots of the Milkyway. Our primary data set will be the Sloan Digital Sky Survey (SDSS) Data Release 6. The results of our work will be able to further simulation research, but that is not this projects goal. Message 334 - Posted: 10 Nov 2007, 18:45:55 UTC - in response to Message 113. This is an excellent project introduction! By the way, I have viewed the sample simulation of tidal disruption. I suggest that this would make an excellent screensaver! I also suggest making the screensaver with two galaxies moving and merging at the same time. With this project, it does not have to be limited to tidal debris but could branch out into other possibilities. Yes, we've had some discussions about what to do for a screensaver and the disruption would be a good start, at least until we can maybe come up with something better that would be a more realistic interpretation of the work being done. And, yes the project could be expanded beyond tidal debris and could be used to search for anything you can model in density space. A little longer WUs would be to prefer. The current ones are only 3-6 min long. BT, the profile and avatar pic. doesn't work to upload. Milkyway@home is based at the Rensselaer Computer Science Department. This particular project is being developed to better understand the power of volunteer computer resources. What is the primary goal of this project? Understanding our Milkyway or understanding the power of grid computing? Or is the goal I'm quoting above reached by running this project while the milkyway is being studied by the WUs? Message 4686 - Posted: 14 Aug 2008, 0:33:09 UTC - in response to Message 4626. The primary goal of Milkyway@home is to study tidal debris through the use of a maximum likelihood technique that utilizes volunteer computing. However, the goal is also to understand the power of volunteer computing. 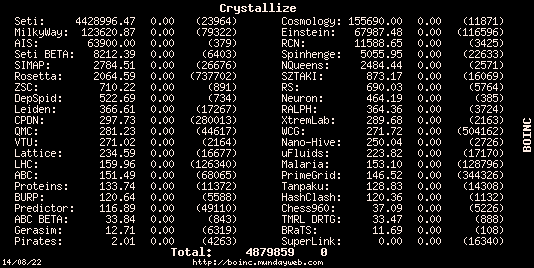 This latter part is possible because we have developed the code such that it can be ran on BOINC, on a supercomputer, and on a cluster of machines. Therefore, we can easily compare these results and determine a good measure of how the resources compare. Therefore, the goal is truly two-fold. Message 4688 - Posted: 14 Aug 2008, 1:57:47 UTC - in response to Message 4686. Bravo. Thank you for taking the time to give all the volunteers a peek at the purpose and process at M@H. We all know you are not the designated baby sitter but we certainly appreciate a little recognition now and then. As a token of my esteem, I just brought on line a Phenom 9850 running at 3.1 ghz. These AMD monsters do love to crunch. Vcore...Vcore...gotta make it sweat to score. Thanks, Nathan.....very interesting. Really appreciate the information. Message 60284 - Posted: 3 Nov 2013, 4:09:55 UTC - in response to Message 113. I was wondering if you could give a brief description of what kinds of calculations are being made to determine the 3d positioning of the bodies in the milky way galaxy. What data do you start with and how does that end up allowing us to determine the 3d position? Is there any unknown aspects in this, by that I mean how accurate do we know we get? I have been donating computing power, and think this project is interesting, but as of yet have not been able to find any information on the nature of what my processor is so intent on crunching. Message 60438 - Posted: 20 Nov 2013, 0:13:27 UTC - in response to Message 60284. I'd like to answer your questions in the near future, most likely I will add them to the Science Page; I'll let you know!